Top roping, although not as common in group climbing as bottom roping, is an important (and often neglected) part of the group climbing experience. Granted, it does not involve as many group members as bottom roping, but it does provide the climber with an opportunity to top out on completing a route, which is a special feeling for a novice climber. It is a great addition to bottom roping and can help give your group a full and varied day. 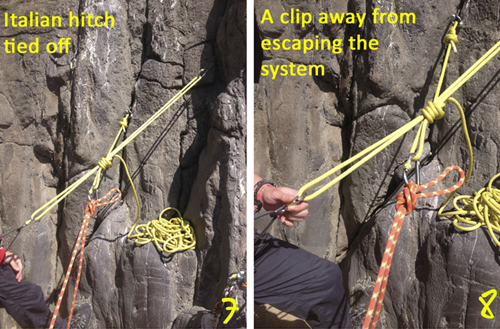 At the top of a crag, consider your personal safety when setting up; clip in to first placement. The use of cow’s tails (or a sling) is good, safe practice. Use a minimum of two sound anchors. Linking anchors with a low stretch rope is good, as it can prevent you slipping over the edge if your system has to take the full body weight of the climber. Slings are an alternative; however, they are not as versatile as a rope. Tie off one anchor with an appropriate knot: overhand on the bight, or figure of eight on the bight. 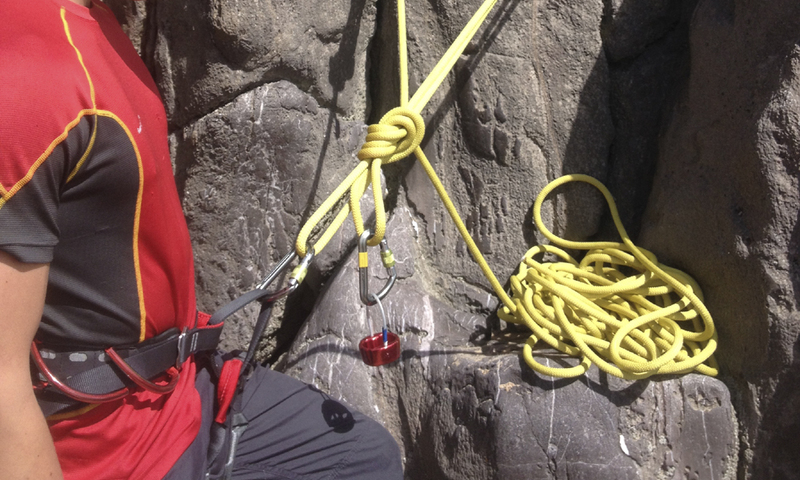 Using a clove hitch to tie off the second anchor will make any adjustments easier to get your body position right. A good knot to consider using at the V at the end of the rope is a double figure of eight on the bight. This works well for a lot of instructors, as it allows one loop to be used to clip into for personal safety, and the other loop for belaying the climber. Other advantages: you can easily tie off the belay device or Italian hitch (image 7), and you are a clip away from escaping the system if a problem arises (image 8). 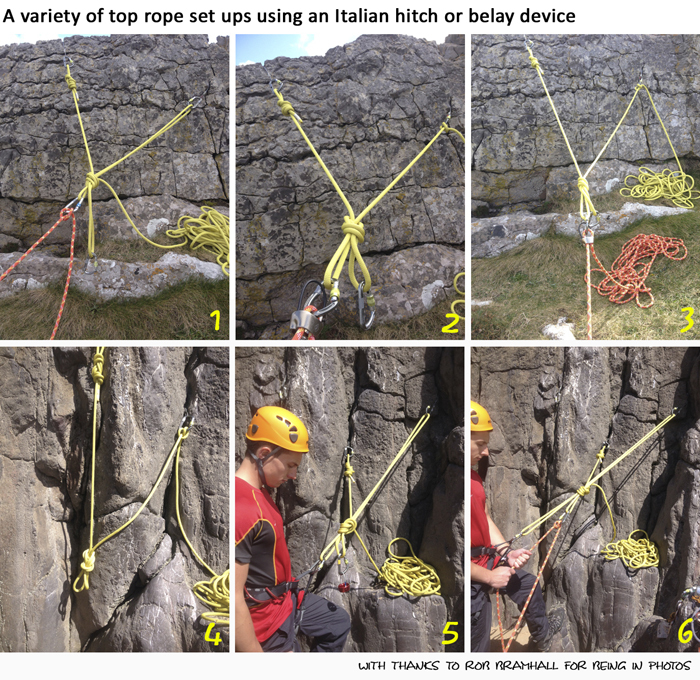 That an Italian hitch locks off in front when adjusting the length of the loops, rather than behind (as when belaying with a belay device). So you can make one loop longer than the other, to suit your body position. To set your system so that everything is in line: anchors, belayer and climber (ABC). This will enable the anchors to remain equalised, and prevent the possibility of you being pulled off balance if the climber slips. Top rope belaying: sit or stand? If your anchors are above waist height, it’s your choice. If the anchors are at waist height or below you will need to sit – as if the climber slips you could be pulled down, and in the process may let go or let the rope slip, putting the climber in danger.